You are here: Home / social media / Facebook / Did you make the BIG mistake of posting this Pilates article too?? Ok, let’s face it…one mistake when you are posting on your studio’s Facebook page isn’t going to lose you thousands of customers, but if you are consistently posting content that is not representing your business you can’t expect your Facebook posts to help build your business and bring in new clients…in fact they may be doing more harm then good! Let me explain. This article came up in my Pilates research feed earlier this week — and I read it — and blew by it without posting it. 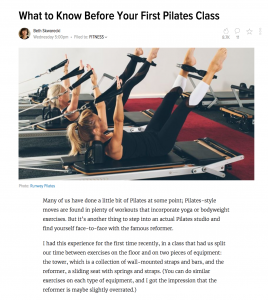 I’m not saying it’s a bad article (everyone is entitled to their opinion about their experience at Pilates) — I’m saying that for most of my clients — I don’t think this article represents their studio well. As I have been reading Facebook the past few days – I have seen it posted on studio after studio. 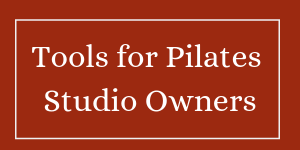 At first glance – it seems like something that would be valuable for potential clients – but then I thought about it – and I tried to view it from the eyes of someone who’s never been to a Pilates studio! Here’s why I didn’t post it. The last sentence of the second paragraph. I got the impression that the reformer is maybe slightly overrated. Reformer classes are generally bread and butter for Pilates Studios. Do you want to “endorse” an article that says Reformer classes are overrated? Consider the four things that the author says to “expect”. The first one is wear nice socks. Really? The most important thing you can expect from your first Pilates class is to wear nice socks? 2nd bullet — do you want people to think they’ll be overwhelmed by the terminology and that they’ll be “corrected” if they use the wrong term? I tend to think most studio owners would prefer to portray their studio as friendly and welcoming. 3rd and 4th bullet. I understand why one bullet of this article would feature core movement – as they are probably covered in anyone’s first Pilates class. However, I am guessing that the instructor who taught the class this author attended made it seem like you should be able to do this on your first time! I can’t even remember how long it took me before I was feeling deep core muscles! “Form is Key” and “Instructors expect precision” – really? I have taken many Pilates classes with first timers in attendance, and I have always been impressed with how patient Pilates instructors are with students. And finally — in the last paragraph. Start with a beginner class if you can, because there’s a lot to learn when it comes to the equipment. It’s not hard, but it’s best if the instructor has the time to explain how to adjust the springs or straps on the equipment. Same type of situation. If i were new I would wonder if I could even learn this — (because “there’s a lot to learn”) and I would be worried that the instructor wouldn’t have time to help me! 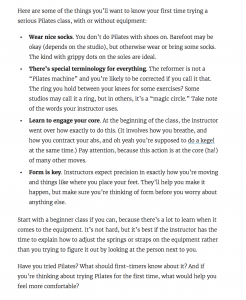 My conclusions — it’s an interesting article, but if I were a studio owner — I’d write my own blog — about how to expect a friendly atmosphere, great explanations of the Pilates exercises, individual attention, couch potato friendly, how Pilates is easy on the joints because it’s low impact and how the Pilates springs help beginners with exercises they might find challenging! Previous Post: « Have you had a Pilates Day failure?